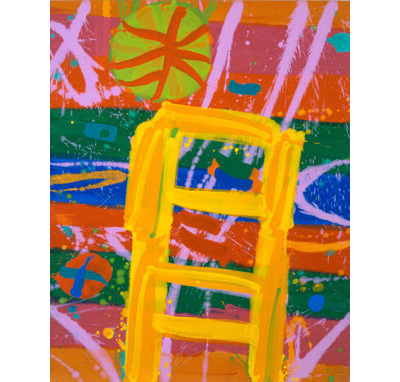 Albert Irvin is an artist who retains a belief in the potential of painting to express universal truths. His conception of what art is and what it can achieve is centred around the brushstroke on canvas. His use of paint and utilisation of colour and shape, is an attempt to develop a set of tools with which to explore and examine human experience and sensibility. For Albert Irvin painting is a life force. Midsummer is an exhibition of new large-scale canvasses by Albert Irvin, who since the 1950s has been exploring the possibilities of paint, colour and the non-figurative form. His paintings may be referential to the wider world, but they do not illustrate it. The new work shows both continuity and change in his pictorial language. The vibrant reds, oranges and yellows that make his paintings so exuberant remain, as do the circles, rings, stripes, lines, and grids. But comparative to work from the mid-1990s, these paintings are emptier, less worked, and less compacted. It is as though the hustle and bustle of earlier works is dispersing, leaving space for purity of colour and clarity of thought. As a result, the visual motifs of large circles and uninhibited diagonal lines seem fresher. By being sparser, Irvin is focusing our attention on the individual components of the work. The space occupied by the shapes, the movement of the line is more concentrated and more definitive. Irvin has introduced a new motif in these new works. A form reminiscent of an arched window invites us to look through the surface of the painting and into its more private depths. So often Irvin's work has been considered in terms of movement across the painting, the line taking the eye on a journey across the width of the canvas. But in these new works, while the journey across can still be traced, it is the journey within that is emphasised. The layers that go into the construction of the image are more visible. The negotiation of obstacles, of line and shape, in order to reach the colour-beginnings, the base colour and starting point of Irvin's work, is a journey of discovering that which is initially concealed, a revelation of sorts. For Irvin, each journey taken within a painting is to analogous the journeys of life. There are two types of life journey, the short, the mundane, the everyday, and then the great swooping arc that is a lifelong journey of self-discovery. Irvin's paintings are signposts along the trajectory of our lives. They may stem from the small seemingly insignificant moments, but accumulatively, they guide us through our lives. In a world that is increasingly driven by the transient attractions of fame and fashion, it is heartening to know that there are artists such as Irvin still willing to seek answers to life's difficult questions. Irvin has maintained his individual faith in the expressive power of painting, a belief that through the language of colour and shape and their mutual relationship, he is able to express something closer to the complex and disorientating experience of being alive. Gimpel Fils is pleased to announce the inauguration of its new contemporary art project space at 30 Davies Street. The Lower Gallery will provide a dedicated exhibition space for emerging artists and one off projects by established artists. The Lower Gallery has recently been renovated and will serve as a new space devoted to showcasing challenging and experimental work. As part of Gimpel Fils' continuing commitment to contemporary art, the Lower Gallery will have its own exhibition programme running concurrently with that in the main gallery. Encompassing diverse artistic practices, including video, photography, drawing, and installation, the exhibition programme will comprise solo shows by artists who have not previously exhibited at the gallery. Seamus Harahan's film Holylands is the inaugural exhibition in the Lower Gallery. Harahan is an artist and filmmaker living in Belfast and his film Holylands was made over a year and a half period from 2001 to 2003. It was shot through the artist's window focusing on the streets occupying a 20-yard radius around his house. The film takes its title, Holylands, from the name of his neighbourhood, a district of the city that combines a transient student population with more long-term residents. The film in part depicts these people, showing fragments of their passage through this territory but firmly resists either a documentary or narrative approach. The film considers the diffuse experiences of urban space, how people move within it, who belongs to it. Intrinsic to the film is our experience of space in terms of the sensory, the collective and the absurd. The film's images are spliced together with a soundtrack that includes hip-hop, traditional Irish and classical music to provide a counterbalance to the images and enables them to work as abstract sequences.